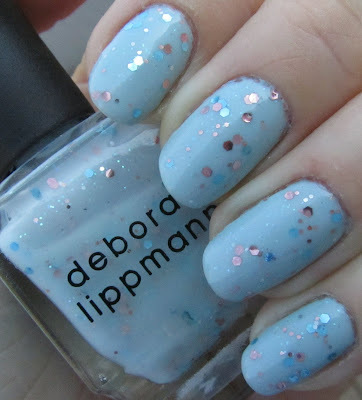 My mom and sister were out shopping the other day, and they were so sweet to pick me out a polish I had been wanting for a long time - Deborah Lippmann Glitter in the Air! While I am excited to try wearing it on its own too, as a super sheer look, I knew I first wanted to wear it layered over a light blue. I know that this is a polish a lot of people have felt let down by this year - everyone was super excited, and then a lot of people ended up not liking it at all, for its sheer color and low glitter payoff. I agree that the glitter density could have been a bit higher, but personally I don't mind adding extra coats to make up for it. I love this look - it is so cute and dainty and fresh feeling. While there was a slight tendency of the glitter to clump a bit, this was easily fixed with one extra swipe of the brush. I am excited to try layering it over other colors, as well as trying it out by itself. 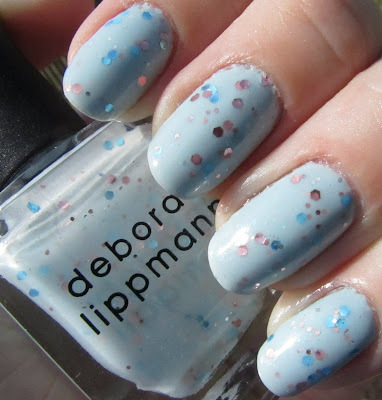 I continue to never have been let down by a Lippmann! I love how this polish looks when layered! I'll have to pick this up eventually. I'm in love with that manicure!